Don’t take our word for it, read what current homeowners are saying about Silverthorne Homebuilders. It’s been 1 year since Silverthorne built our custom ranch home. Jim and Keith were wonderful to work with. Everything that we wanted in our dream home was done. They never said no to the things that we wanted. We had a slow start due to the counties slow permit process but once we got them it was only 4 months from start to completion. The portal was amazing. I don’t know how you would build a house without it. We have had minimal issues this past year and they have been taken care of promptly. We love our home and highly recommend Silverthorne Group. A lot of hard work went into building our home with Silverthorne. Keith and Jim were willing to go the extra mile. We made some revisions to the original plan and we are very grateful they realized one size does not fit all and were willing to let us put our own stamp on our forever home. Our minimal issues were handled along the way and they’ve gone above and beyond on to keep us happy Silverthorne homeowners. Silverthorne homes are amazing! Their customer portal helps you keep track of your monies and conversations….no surprises. You cannot build a house without having a couple of bumps in the road. Silverthorne works through these issues with you. My special thanks to Jim and Keith for putting up with every Pinterest idea I had and turning them into my dream home! I love it!! Silverthorne Builders did a fantastic job making our dream home come alive. 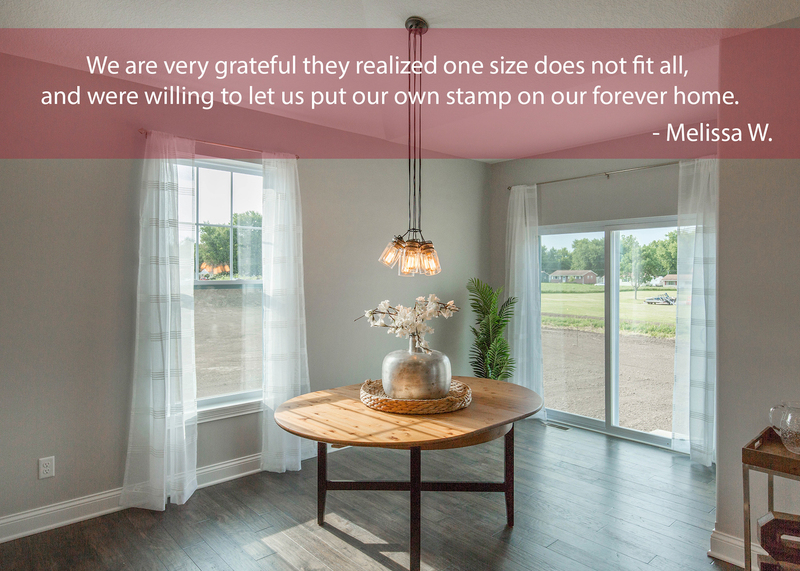 They built a custom home on our lot and the entire process exceeded our expectations. They had a can do attitude on all of the options that we wanted. I can’t say enough about the portal. As there were so many decisions to be made, the portal made the communication process so much easier. We don’t know how anyone could build a house without it. Thank you, Jim and Keith, for building us a beautiful home. Silverthorne Group provides a Quality Custom Home at an Affordable price. Their base prices on their models include amenities that other builders consider options. Great Quality Homes followed up with Great Customer Service. Lots of upgrades included in standard plans including many not even offered by other builders. I especially like the wide door trim, baseboards and the extra detail of the architrades over the interior doors – a real nice classical architectural touch. We are so happy with our new home. The Upgrades (from other builders) that you get as a standard really make a unique home. Deep pour, three car garage, Granite tops, full lawn and front landscaping are just a few that make our home special. The sales team were very easy to work and with the Silverthorne Homes selection Portal is was so easy to make our selections on our time at our pace with no sales pressure. This truly was a unique and fun way to build a new house.